I've been making an effort to use up what's sitting in my freezer, fridge, and pantry this summer. I let some nectarines get a little overly-ripe, and I thought, "These would be perfect for a crisp, but I don't think I have the ingredients... 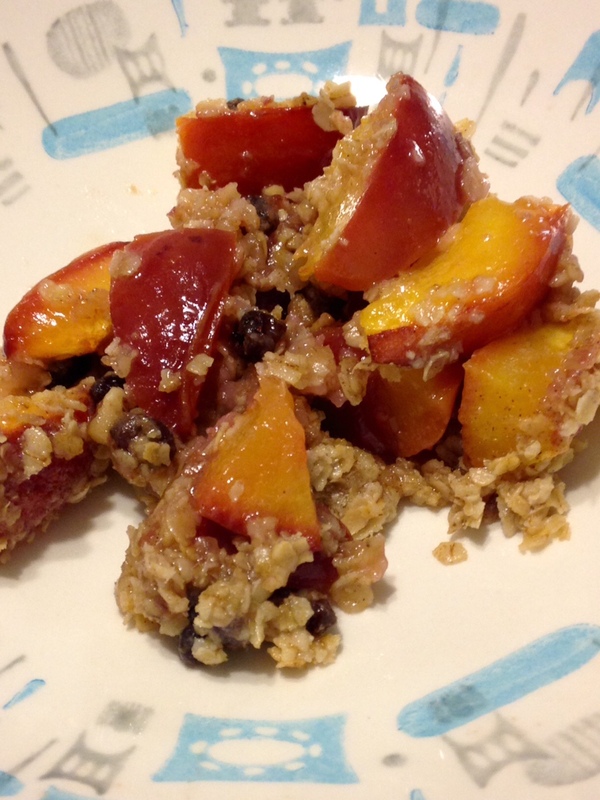 Wait a minute... Maybe I do..." And thus the 5-ingredient fruit crisp was born. Cut nectarines into uniform pieces, approximately 1" across. Transfer nectarine pieces to baking dish, then cover with lemon juice and sugar. Evenly distribute oatmeal packets over the nectarines. Melt butter and then pour over oatmeal as evenly as possible. Bake for about 30-40 minutes. Oats should be a golden brown, and you should see bubbling. This is easily adaptable to any fruit you have on hand. Your objective is to get even coverage of all ingredients over your fruit--light coverage with the lemon juice and sugar, heavier coverage with the oatmeal and butter. If you use more fruit, you'll probably need to bake longer. Just keep a lookout for bubbling and color.